Google Earth now available for Android 2.1 | Android Blast! Google has made Google Earth available for Android 2.1 phones. The application is in the Android Market and is ready for download. Google says it is "our fastest mobile version of Google Earth yet, with a smooth framerate and a beautiful 800 x 480 screen." 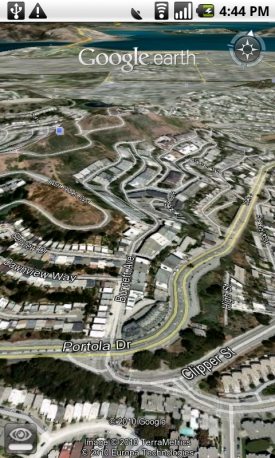 The release of the Nexus One and all its speed has prompted Google to push the limits of a mobile Google Earth by "drawing complex scenes of 3D imagery, terrain, roads, and other layers." They've added a new feature to Google Earth for Android 2.1 called Roads Layer which is available in the desktop version. They've also taken advantage of Android's voice recognition capabilities. Check it out in the Android Market if you have Android 2.1.